Here’s the notes for episode #207 of Well-Fed Women. Be sure to check back every Tuesday for a new episode, and head over to Apple Podcasts or Stitcher to subscribe! 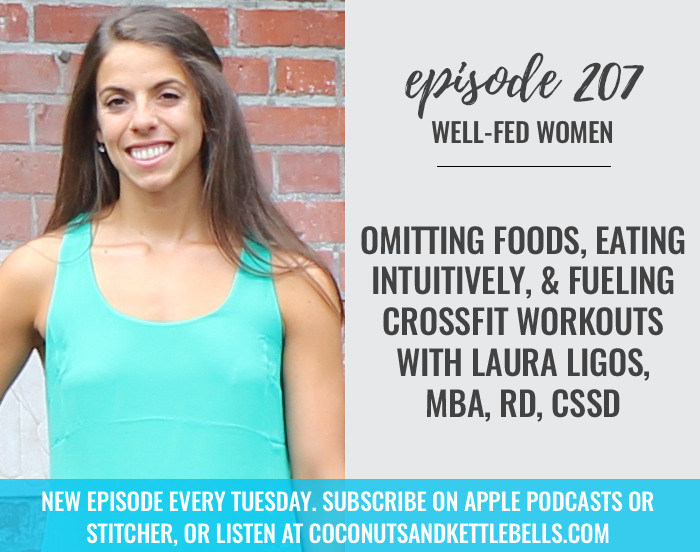 In this episode, Noelle is joined by another Well-Fed Woman Laura Ligos, MBA, RD, CSSD to discuss omitting foods, eating intuitively, and fueling crossfit workouts. Bonafide Provisions is the maker of traditionally prepared, collagen-rich bone broth, packed with all the immune-boosting benefits. Their mission is to help everyone experience abundant wellness through the healing power of real food. Bonafide Provisions is offering our listeners 20% off all Bonafide products when you use the code: WELLFED at checkout. Go to www.bonafideprovisions.com/WELLFED to put your order in now! Bonafide Provisions bone broth is frozen, meaning they preserve nutrients at their peak. Other brands of bone broth are boxed or refrigerated are either pasteurized or use a hot-fill method, which could be problematic if the packaging is poor quality. They use the best of the best ingredients, all of which are organic and preservative free. All their products are made using proper preparation methods making their broths nutrient packed. They only using bones (no meat or pre-made filler), and simmer low and slow. This means the bone broth gels and has a higher collagen content than leading boxed brands.